In this physics puzzle candy game you have to feed misery candy .Enter the world of candy land where our misery candy, candy stand, life saver candy and candy monster. Solving physics based free puzzle is easy, just use your finger to misery candy donut roll to continuously turn the candy stand in both directions to fall down one candy stand to another. To help misery candy to escape from monster and make donut roll to happy jump drop to achieve goal. 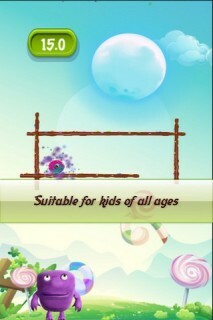 Tap to rotate the candy stand and guide jumping candy player into candy portal before time runs out. Careful from blade or being eaten by bat . Fall into candy stand and you will fall to other. Hit a broken wall and candy player will pass through it. Spring will propel donut roll. If you fall out of the candy stick cage the donut roll will become monster dinner. 1. Its cool game to play for all ages. 2. You can play this game with kids ,family , friends. 4. Delightfully candy land graphics. 5. A free fun game.